Altered and Adorned: Using Renaissance Prints in Daily Life is the elegant companion to last summer’s exhibition of the same name at The Art Institute of Chicago. Thoughtfully and cleverly assembled, the show revealed unexpected uses for prints of the 15th- and 16th-centuries. The catalogue carries on this work and helps to illuminate the ephemeral qualities of print, as well as the more lasting concepts that printed multiples can convey to a broader, contemporary audience. Author Suzanne Karr Schmidt has a comprehensive command of the subject, and her delight in the curious lore of each object is evident. As the Andrew W. Mellon Curatorial Fellow in Prints and Drawings at The Art Institute of Chicago, she and her colleague Kimberly Nichols (Associate Paper Conservator in Prints and Drawings) offer inventive ways to see the past through prints—and prints through the past. Fig. 1. 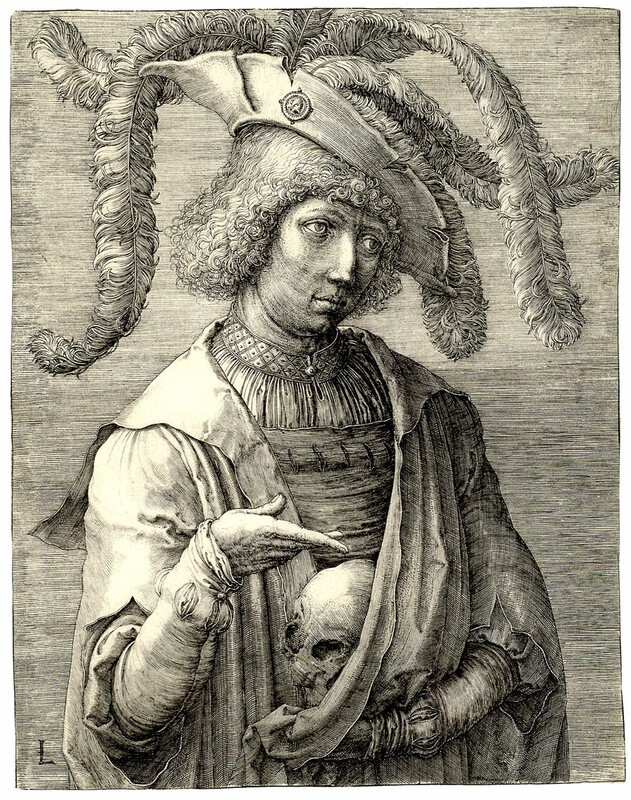 Lucas van Leyden, Portrait of a Young Man with a Skull (c. 1519), engraving on ivory laid paper, 18.3 x 14.4 cm. The Art Institute of Chicago, Clarence Buckingham Collection, 1940.1314. The works discussed have been selected from a variety of sources: The Art Institute’s own rich inventory, as well as other collections in Chicago that are perhaps rarely tapped for such fragile treasures, including the Loyola University Museum of Art, the Adler Planetarium and Northwestern University’s Feinberg School of Medicine. 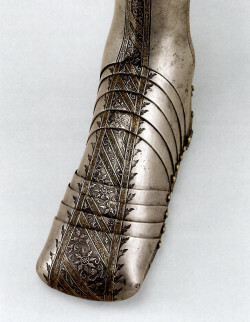 Throughout the catalogue’s many essays, physical traces of human actions are described in detail. Dents, scrapes, incisions, hand-coloring, collage and subtle graffiti constitute strong evidence of what Walter Benjamin would later call “aura”: “the essence of all that is transmissible from the object’s beginning, ranging from its substantive duration to its testimony to the history which it has experienced.”1 Though they were originally mass-produced, individual histories and human aspirations have become embedded in these objects. In other words, these works have soul. Fig. 2. Attributed to Wolfgang Grosschedel, detail of left greave with sabaton and spur (c. 1550), acid-etched steel with blackening and gilding, 48 x 35 cm, weight 2 1/2 bs. George F. Harding Collection, 1982.2695. 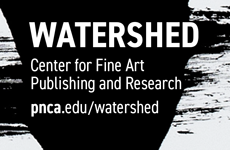 “Materiality” has become a hot topic in the visual arts, reflecting the importance of the viewer’s interaction with actual/tangible objects rather than with the pixellated distortions we have come to accept from the digital world. 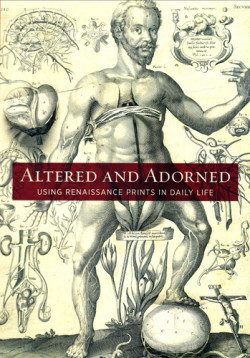 Altered and Adorned reminds us that these printed images were objects first, and it explores the jobs they performed, from science and education to decoration and devotion. The interior lid of a leather coffer from 1490 reveals a stencil-colored woodcut in its rare original context. 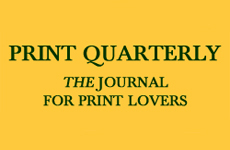 Inside a pigskin-bound volume is a printed paper sundial with a moving brass arm. A printed piece of Italian linen predates woodblock printing on paper. 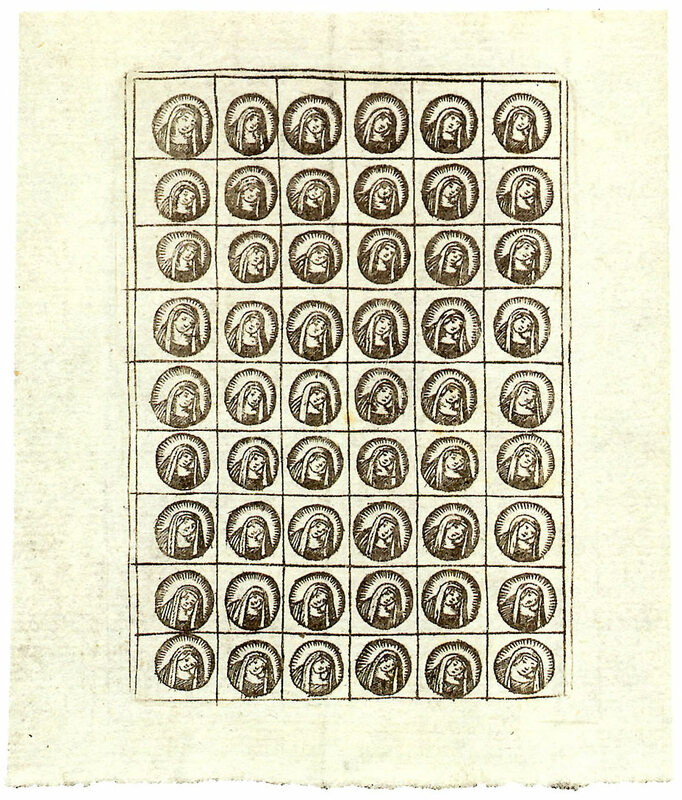 The book also illustrates examples of wallpaper, a printed product that served many purposes, from protection against cold and mold to imaginary travel. 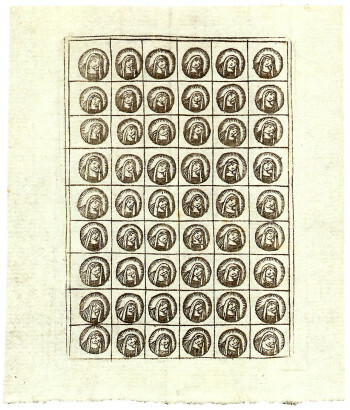 There are so many applications for the printed image, it seems each section in the book could easily be expanded into a volume of its own. Fig. 4. 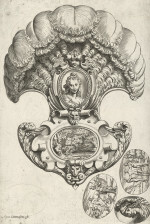 Johann Melchior Gutwein, Schlückbilder (Edible Prints) (c. 1749), etching on light greenish blue laid paper, image 7.9 x 6 cm, sheet 9.1 x 8.7 cm. Private collection. The chapter “Single- and Multi-Sheet Prints” features works by Albrecht Dürer and his studio, including The Men’s Bath from 1496/1497 in an impression so pristine that it appears as if it were pulled from the press yesterday—its protected state is perhaps an indication of its value from the start. The book provides a sharp, near full-size reproduction to help viewers appreciate the narrative details that Karr Schmidt points out. Other highlights of the catalogue are The Art Institute’s three recently acquired lift-the-flap anatomical prints by Lucas Kilian (1613) [see Karr Schmidt, “Printed Bodies,” Art in Print, Vol. 1, No. 1]. In these complex prints, layer upon layer of flaps reveal the inner workings of the human body and a profound appreciation of nature. Details are pulled out to illuminate various markmaking and assembly techniques. At the same time, the book’s finely printed illustrations reveal the personality and skill of the artist reflected in the expressions and gestures of the characters. Fig. 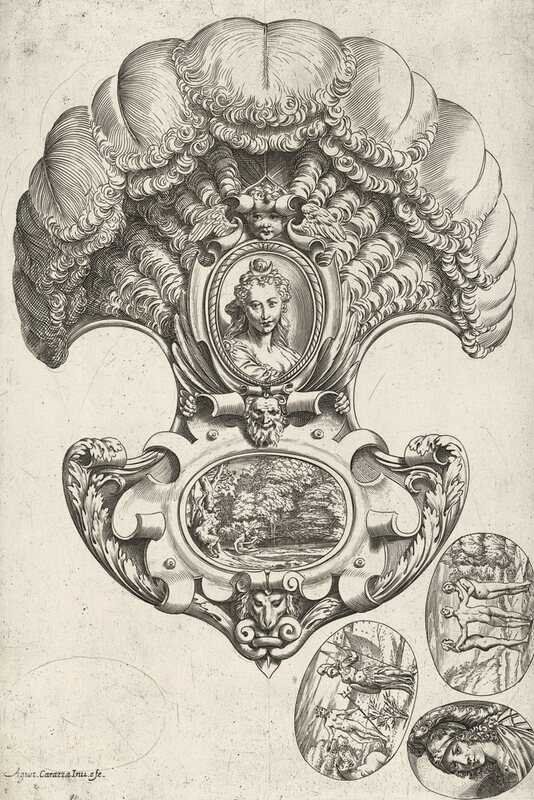 3 Agostino Carracci, Headpiece in the Form of a Fan (c. 1589), engraving on ivory laid paper, meant to be cut out and worn, with interchangeable oval vignettes, image/sheet (cut within plate mark), 37 x 24.8 cm. Joseph Brooks Fair Collection, 1942.250. There is some irony to the task of reviewing a catalogue of reproductions that emphasize the material presence of the originals. In person, you have a sense of the dimensionality and actuality of these “things as things,” qualities that cannot be reproduced. But the book—with its images enlarged and contrast adjusted—allows us to see things we cannot see in person. Understanding and enjoyment are maximized when we toggle between the two. The exhibition and book emphasize the critical importance of museums in the conservation and preservation of physical artifacts that would normally (and quickly) turn to dust. 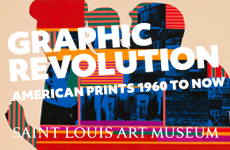 The book just might encourage modern viewers to attend these types of exhibitions and to visit print departments to experience these “rare survivors” first hand.